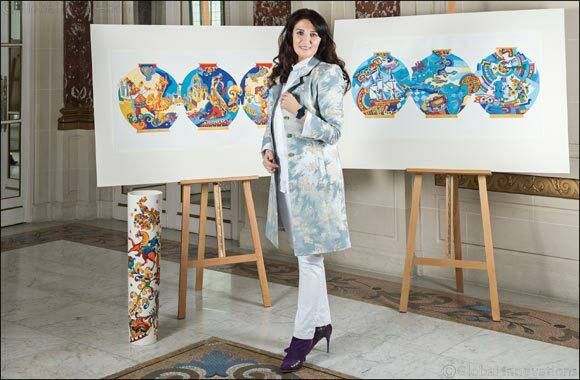 Dubai, UAE, March 26, 2019: Symbolism, tradition, opulence and colour are the hallmarks of the work of renowned Russian artist and designer Evgenia Miro. Drawing on emblems and motifs that trace their origins back through centuries of storytelling, Evgenia creates beautiful designs that she applies to a range of materials to create enduring pieces designed to stand the test of time. From decorated silks to delicate china, Evgenia has now progressed to working on a micro scale with high-tech ceramic for the watch she has co-created with pioneering Swiss watchmaker Rado. Considered the most forward-thinking design player in the watch industry, Rado worked closely with Evgenia as she brought her unique vision and perspective to a watch collection that is known for its slim silhouette, confident construction and the way it revolutionised traditional watchmaking on its debut in 2011. Created in durable and scratch-resistant high-tech ceramic, the familiar monobloc case and bracelet of the True Thinline collection feature precision laser engravings of a delicate and distinctive feather pattern. Evgenia’s unique concept sees the bird’s feather creating a new philosophy of time with its lightness and dynamic rhythm of fine lines. She believes we are at our most active and productive between 1 o’clock and 7 o’clock and she chose to place the feather diagonally across the dial at these points to express this. The feather is also a symbol of the lightness of high-tech ceramic. Using the deep rich blue that she believes has a deep philosophical and symbolic meaning, Evgenia’s True Thinline is designed to communicate wisdom, nobility and spirituality. The strong, deep colour is complemented by contrasting rose gold coloured hands and the metallised Rado logo. To Evgenia, the symbol of the bird stands for tenderness, wisdom and refinement as well as for freedom and she chose to place it on the case back where it is worn next to the skin. The bird she has chosen is opulent and proud, its red and gold plumage symbolising warmth and light - a theme often seen in her work. The bird is digitally printed on the sapphire crystal case back – a first at Rado. Speaking about the collaboration with Evgenia Miro, Rado CEO Matthias Breschan said: “Working with Evgenia to create this watch was a unique experience. The Rado True Thinline My Bird Limited Edition is one of the latest models in a series of designer collaborations for Rado, a multi award-winning designer in its own right. Featuring watches co-created with renowned designers from a range of design disciplines, Rado cements its claim as the go-to brand in watch design.